Hello and welcome to this week’s CASEing the Catty Blog Hop! Whether you’re joining the Hop here, or if you’ve hopped on over from Monique at Stamping with MoniQ – or back from Kelly at My Papercraft Journey – a BIG hello! Remember to click on through this week’s CTC crew to see plenty of inspirational projects that the crew have created for you – there’s a full list on the CTC blog page if you get lost along the way. This week the crew is taking inspiration from one of the fab Punch bundles in the Holiday Catalogue! There’s a few – and some have made it onto the carryover list, so will be available after the Holiday Catalogue finishes on 3 January. I’ve combined two of the punch Bundles in my project this week. 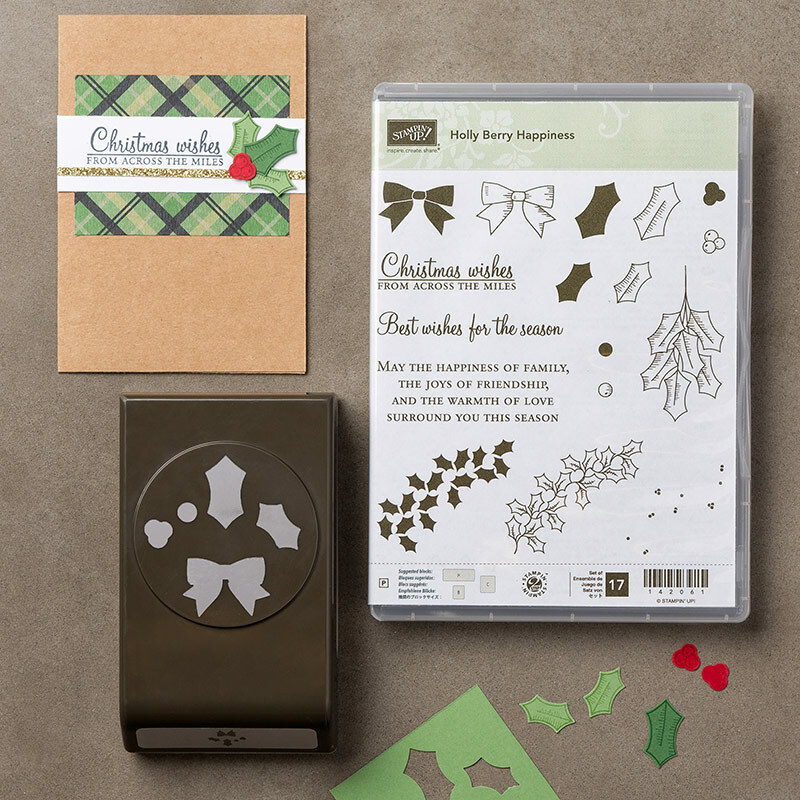 I’m using the Holly Berry Punch Bundle – love all the little elements included in the both the punch and the stamp set. This makes it a very versatile set. In fact – did you know that the punch also matches the 2-step bow stamp in the Baby Bear stamp set from the Annual Catalogue. And I’ve CASE’d my Hubby’s favourite card from the Holiday catalogue – the moose card found on page 29 of the catalogue. We love the clean lines of this layout. How can you resist that moose? My CASE uses the bow image and Punch to create a cute baby card. The card base and background bows are in Marina Mist, while the raised single bow is on Whisper White card, stamped in Night of Navy (outline) and Marina Mist (fill). A couple of dimensionals behind the loops makes the bow pop off the page. Those stripes along the bottom are one of the washi tapes from the Floral Boutique Designer Series Washi set. The 1cm strip of Whisper White has one of the sentiments from the Baby Bear set – stamped repeatedly in Marina Mist – with one on Night of Navy. And here’s a peek of the inside of the card – ‘cos you just have to decorate that too – don’t you? I do hope you’ve enjoyed my project this week! Feel free to leave me a comment in the section below – love hearing from you! As always, CASEing the Catty is running a monthly challenge – so you can play along too! We’d love you to share your own project that takes inspiration from one of the punch bundles in the Stampin’ Up! 2016 Holiday catalogue. Just click on the Join Challenge Button below and you can add your project to the linky you will find at the bottom of the post. A winner will be chosen and announced on the first post of the following month. Now depending on the direction you’re hopping– hop on forward to the next blog – Kelly at My Paper Craft Journey – or go back to the Previous Blog – Monique at Stamping with Moni-Q. And remember if you get lost along the way – head to the CTC Blog Home Page where you will see all those involved in this week’s CASEing the Catty Blog Hop and make sure you haven’t missed any of the great creations! Thanks for stopping by and hope you enjoy all the other posts in the hop! Many of the retiring items are now on sale – you can check the complete list here – though availablitiy of some items may change at any time as products are while stocks last. In addition to retiring items being on sale – Stampin’ Up! is clearing out overstocked items and the clearance rack and there are many items now on Sale – including some at 60% discount! Click on the Closeout Sale image above to check out everything that is available. Or you can shop 24/7 at my online Stampin’ Up! shop – just click on the items in the table below or click the “Shop Now” button at the Top Right of the page. That bow must be almost the nicest in the catalogue, looks great stamped all over. I love your idea for the card. It’s totally wonderful. Thankyou for the fabulous inspiration. Jackie and can not believe that you turned this set into a baby card, just shows us all how versatile Stampin’ Up! stamp sets and punches are. Oh wow! Jackie, creativity at its best! Love your take on the challenge this week. Just shows how you can use a Christmas set all year round.